An air conditioning system is rather simple really in the number of parts it's made up of. 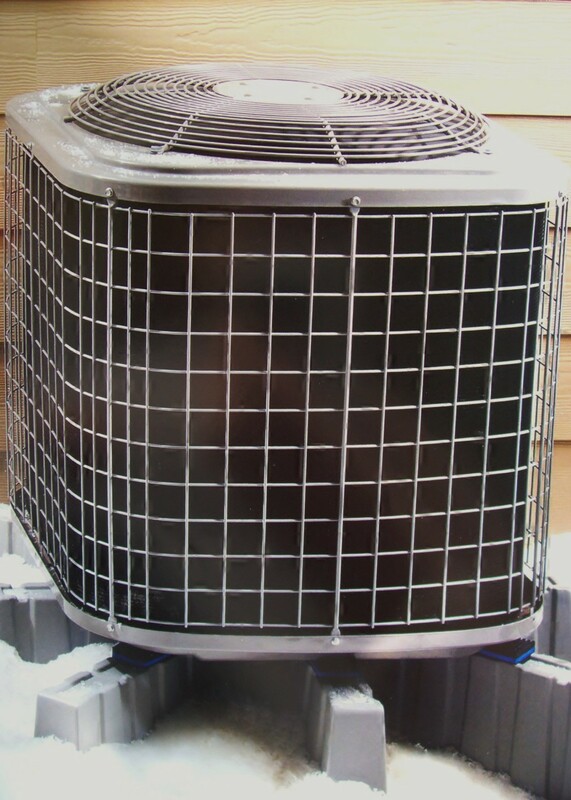 In reality, the system is made up of two main components, the condenser, and the coil. There are other things that are a necessary to connect and help the system function but they aren't dedicated solely to the A/C system. For example, the thermostat and the furnace, or air handler, are not solely belonging to the air conditioning system. With that said, the condenser is the only real mechanical part of the system. The evaporator coil is really just a box of fins and tubing with a drain attached to carry off the condensation it collects. What I aim to do is explain only the parts of the condensing unit. This is the piece where the problems will likely occur and the more you know about what it's made up of, the less likely you are to be "taken" by a shady service technician. It's unfortunate but, they are out there. The compressor is the head honcho in the air conditioning system. If it breaks down, forget fixing it yourself and carefully weigh the expense of replacing it verses getting a whole new system. Especially if you have an out of date, now obsolete R-22 system. Today's compressors are what is called "hermetic", meaning sealed. There is no opening them up and putting them back together. They are also nearly all of the scroll type. This means that instead of a piston pushing up and down on the refrigerant, it is a rotating component that is doing the work. This is beneficial since the impact of a piston is not good for itself. Plus, the scroll type will be much quieter during operation. 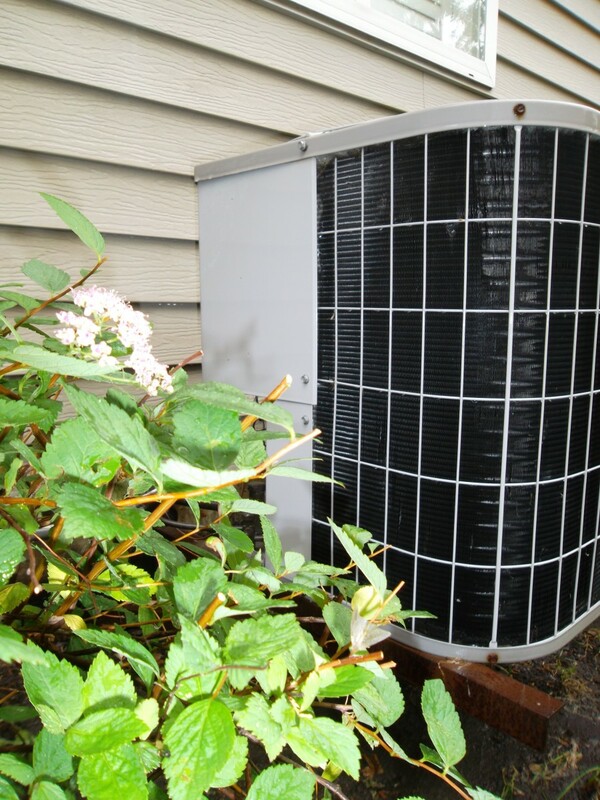 The condenser fan and motor are an essential part of the air conditioning system as well. 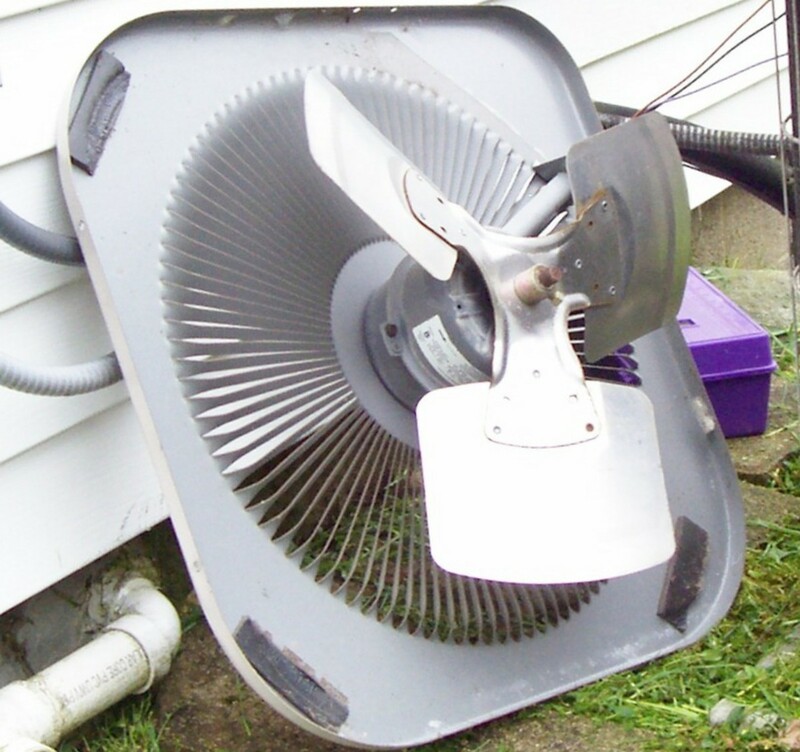 This fan is used to pull air through the coils of the condenser to help cool the refrigerant and compressor as well as displace the heat that is coming off of those parts. This is why the fan is blowing warm air out of the unit. This is also why cut grass, leaves and "fuzzies" are pulled into the fins on the coils which must be kept clean for good airflow. With the air being drawn in by the fan comes all sorts of things that block air and keep our condenser from working as efficiently as it should. I wrote an article all about how to clean your coils to help you out with this. These motors are sealed so that rain cannot get into the working parts of the motor. Be sure that if you have the motor replaced that the housing of the motor is solid and does not have "breather" ports on it. Some do not realize this difference and assume a blower motor can be used to replace a condenser motor. This mistake will surely cause problems if made. NOTE: The condenser fan motor and compressor are the 2 parts that you want to be sure have a decent warranty when making an A/C system purchase. Most other parts will have only a year long warranty but are rather inexpensive to replace if needed later. Not so much for the fan motor and compressor. Take the same thoughts on the air passing over the condenser coils and apply that to the evaporator coil inside where gas is converting from liquid to gas and you'll begin to understand more why the air filter being clean is so important to air conditioning. 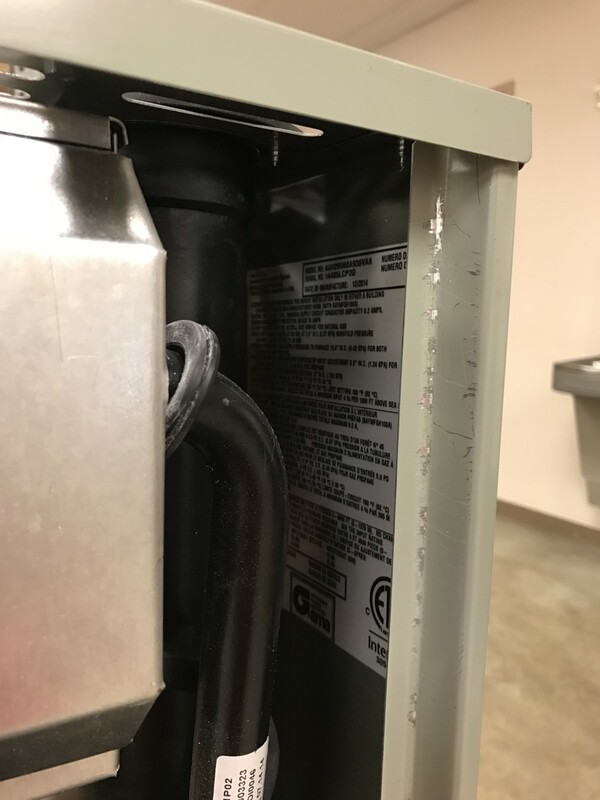 A dirty filter restricts airflow and thus raises the temperature inside the unit which has an affect on the refrigerant's evaporation process. 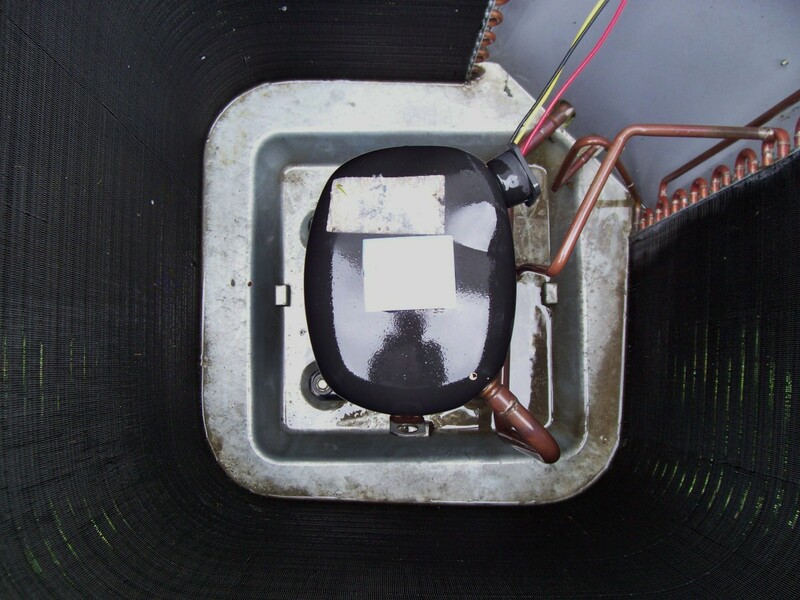 The condenser coil is where the process of the refrigerant returning from a gas to a liquid begins. There is no mechanical function here. The coils either contain refrigerant or they don't. Of course, if they don't, you have a problem on your hands. Air conditioning is all about the relationship between temperature and pressure. These two things together are manipulated so that the refrigerant in the system will change back and forth from liquid to gas. This is a very nutshell explanation of how air conditioning works but that is another conversation altogether. 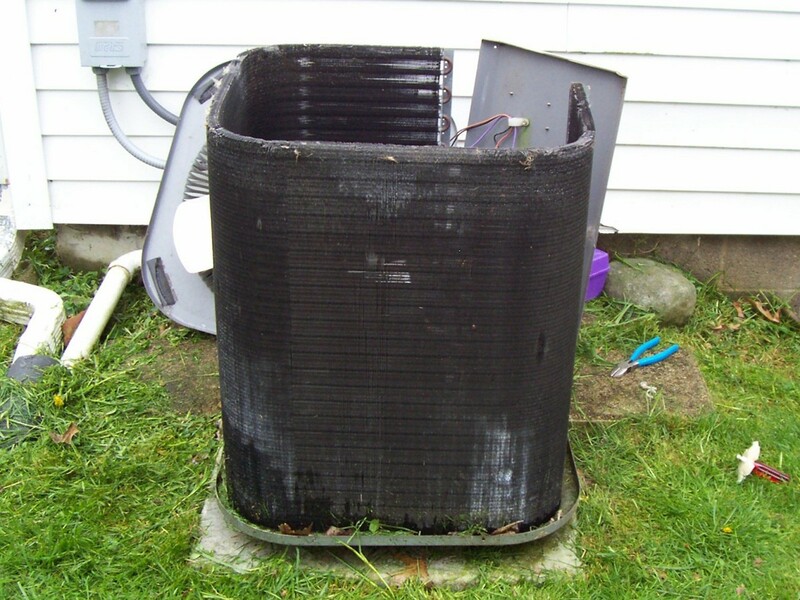 The coil area of a condenser has a significant impact on how efficiently our air conditioner is. 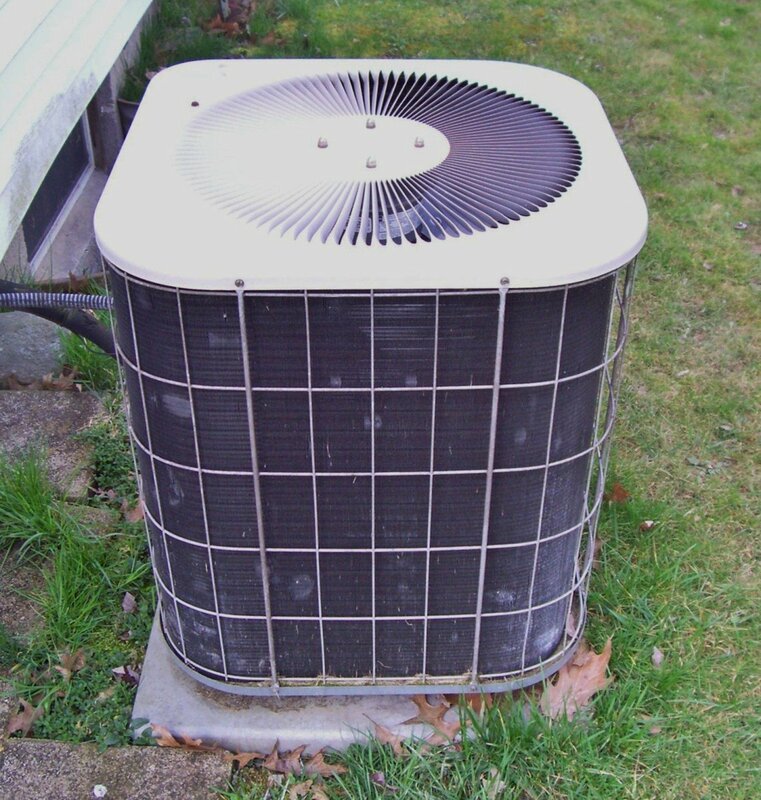 You may have noticed that lately, the air conditioners that people are having installed are much larger than those they replaced. This is largely related to the fact that energy regulations have commanded that the minimum SEER rating (efficiency rating) be increased over the last few years. Increasing the amount of coil space helps to increase the efficiency of converting our refrigerant from gas to liquid thus increasing SEER rating and why size has grown. The capacitor's function is rather simple, to provide a boost of electricity to help start or run motors. It sort of works like a battery in the respect that it stores power. When the air conditioner is asked to operate, the capacitor discharges this stored energy, providing a boost to get the motor going. These capacitors do blow and when they do, it's really quite simple to diagnose and replace. I wrote a guide to help you diagnose and replace your A/C capacitor, which should give you a solid understanding of how to do this. You may see an oily discharge, in some cases, dripping down the side of the capacitor or perhaps yours won't entirely "pop" and instead, just the top will be humped up. This top should be flat. Of course, the first thing you'll notice is that your A/C isn't working and that the fan is not spinning. The contactor is a sort of power bridge. In the photo, you can see a button in the center of the component. This button serves as a drawbridge. When the thermostat tells the furnace that it wants cooling, the furnace then relays this message to the contactor via a 24V signal. 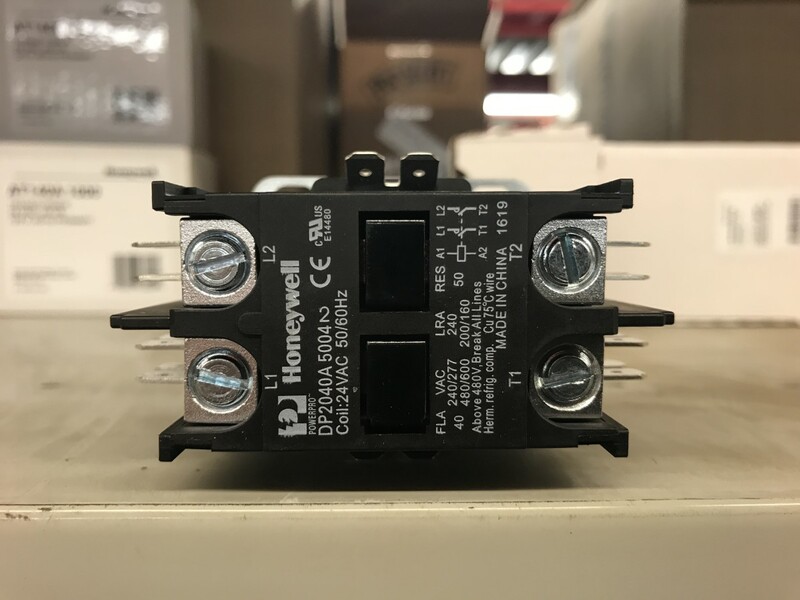 When the 24V hits the contactor, it creates a magnetism that pulls in this button, thus closing the bridge and allowing power to cross through to the condenser fan and compressor. 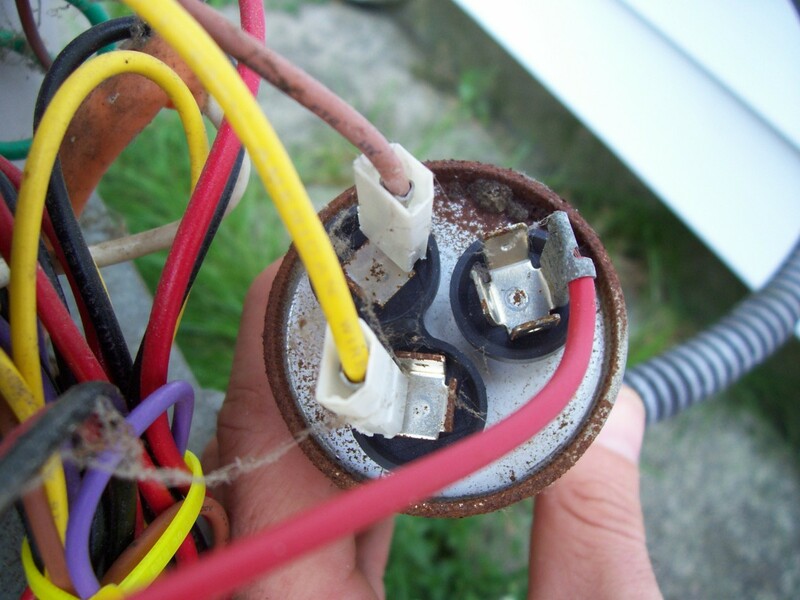 Here is where you may sometimes see that your A/C fuses are blown. You may hear the unit humming and see that the contactor button is pulled in but nothing is happening. This is likely because the fuses protecting the unit are blown and though the button is pulled in, there is no power waiting to "cross the bridge". NOTE: There is 220V passing across this drawbridge. It's certainly not the type of bridge you care to play around with if you prefer to keep control of your own functions. Things That Make You Say, "Really?" Air conditioning systems are rather simple. It's the science that is difficult to understand. That's it really. Some more modern, advanced air conditioning condensers do have an electronic control board but typically, what I've shown you is all you have in your condensing unit. Now as I mentioned, the condenser is the main unit but it cannot operate without help from it's friends. There must be an indoor fan to move the air, a thermostat to tell the unit when to turn off and on, and an evaporator coil to help manipulate the refrigerant and absorb the heat from within your home. I hope you feel that you know a bit more about your A/C system and what it is made up of. Just remember, when it comes to your A/C, always take care when maintaining the system. Turn off the power, be careful not to bend any of the fins or copper tubing and never open the refrigerant valves or tubing to the atmosphere. Not only is this harmful to the environment but it can cause severe burns and is against the law with very heavy repercussions. Stay safe! What is the control piece on an A/C? I'm not exactly sure what you mean however the thermostat controls the A/C. 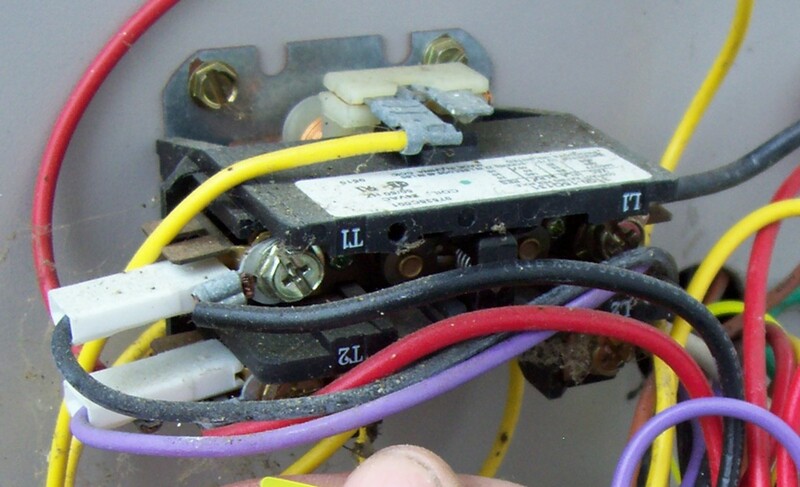 The contactor is what acts as the on/off switch so to speak. Beyond that, there isn't really a control unless perhaps you have some sort of modulating or communicating the type of unit. My AC works great most of the time, except when the outside temperature is 105+ degrees. Then once or twice a day, it starts blowing warm air (85 degrees at the closest register). I turn the system off for 10 minutes and usually the cold air comes back by the first try. The AC guys keep telling me my unit is working just fine. What should they look for? The good news is it’s working, but the bad news is it may be tripping a limit due to extreme operating conditions. When you shut it down, giving it a chance to cool, the limit is probably resetting and allowing it to work again until it begins to run too hot and tripping the limit again. The AC guys may very well be right that the unit is working correctly though I’m sure that answer won't make you happy. Don’t be tempted to spray the unit with a hose to cool it. You could cause serious damage. What role does the indoor thermostat play in regards to my AC unit? Also, how do I know if this may need to be replaced? The thermostat is the command center of your HVAC system. You would have to eliminate it from the circuit and run some electrical tests to be sure. 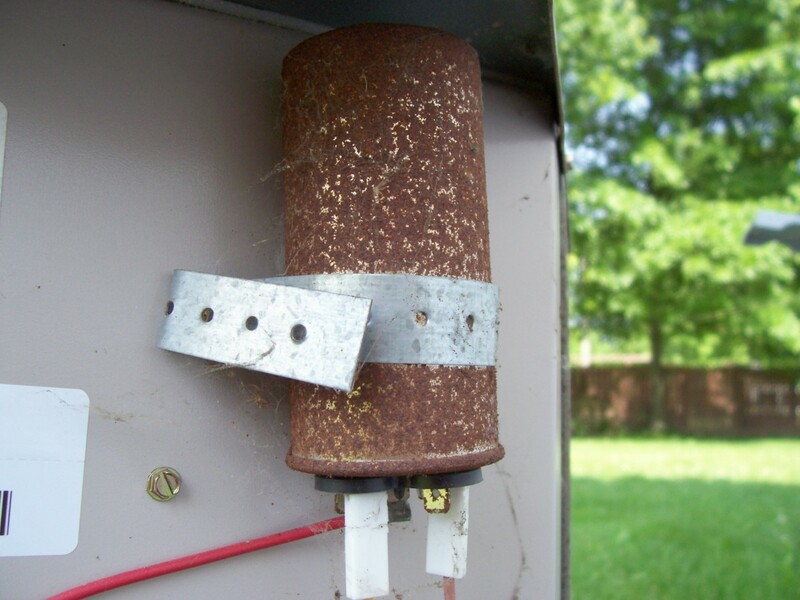 where can I get a condenser fan motor to replace an old one? You'll need to find a contractor supply house near you. A place like Ferguson (which is a national chain and why I mention them as an example) or maybe Grainger. (Again, national) there are likely more but I don't know where you are so I don't know who else to tell you since the places near me are typically within my state only. Is there such a part as a conductor in an a/c unit? Perhaps someone is referring to the contactor. While that’s not the common term I can see why someone may call it that. My dog chewed the thermostat wire the contractor. I reconnected the red & white thermostat wire back, but can’t turn on the unit with the thermostat. I can press the contractor button & condenser fan, and the compressor turns on and cools. What failed? I would imagine it’s still the wire and you may have to do more than just reconnect it. Perhaps replace a whole section. Assuming the unit worked before this. It may have shorted the fuse on the board? Thank you Don. That is the goal. The best way to protect yourself from being "hosed" by bad apples in the industry is to try and learn as much as you can about your system. I appreciate the feedback! Thank you for this info, you did a great job here! And now I know what to present to the repair company and what they may present to me. Thank you Erwin. I hope so. And very informative article, this will really save me some headaches and money. Vince - It could just be coincidence. It could be that because it ran that way it over heated and shut down by tripping a limit which might reset itself once it sits. Otherwise, I would imagine it can be fixed whatever is the issue but am not positive what that issue is. My wife turned on the a.c. when it still had the cover on it and when I realized it and took of the cover the fan had stoped working. Would that be fuse or something else . Can it be fixed. Ellen - If a test has been run that the capacitance is low then it's a matter of time and I'd replace it before it becomes an inconvenient problem. Thank you for reading. What happens when the capacitor is bad but not blow yet? Hi Tom, Contact your local Tempstar dealer and give them the model and serial number and they can special order that in for you. It's not likely something anyone will stock so you'll likely be looking at the cost plus shipping and tax. I need the "lid" that the motor is mounted to...have a tempstar ...but can't seem to find the lid. Lookds exactly like the one at the top of the page.... can anyeone help...???? Very helpful. 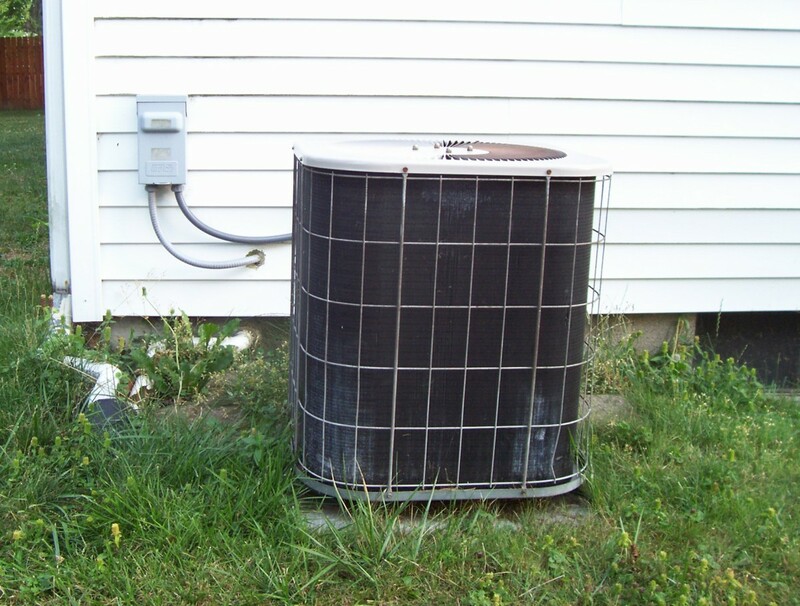 A/C units are really fairly simple once you break down their components the way you've done. @ SOMEONEWHOKNOWS - Geo-Thermal is the wave of the future......once the average individual can afford it. You are absolutely right though. The fact is, and I know from experience, people can hardly afford energy costs therefore breakdowns force them to go without. Times are hard and people have turned down my services in the dead of winter and heat of summer because they couldn't afford it no matter how low the price....a big part of why I write these hubs. Great hub. Very informatuve. GBY. Amazing - all the things I never knew. This is critical information for all homeowners. Thank you! Voted up and rated awesome - keep up the fantastic work. @oscarlites - I know it can be tough but many of my hubs explain that though this is the case, HVAC supply houses will often help you if you are prepared with the information they need to help you. This tells them you won't kill yourself working on the unit. That is parts that aren't proprietary or require an EPA license. This is largely out of their hands. Thanks for your comments. just got done having to replace the fan motor on the outside unit.. once i got the rigth motor it was easy.. sometimes you can't get the brand name part, or have to have a license. etc. Thanks everyone for your congrats and support. I really do appreciate it and hope that I've been able to provide you with something you'll be able to use. I would reply individually however my reply button is MIA so I hope this will do in it's place. Thank you again and thank you to HP for selecting this for HOTD. Very good hub and congratulations on your hub being selected for "hub of the day". Great hub and very well written. Congratulations on your Hub of the Day! Excellent article. 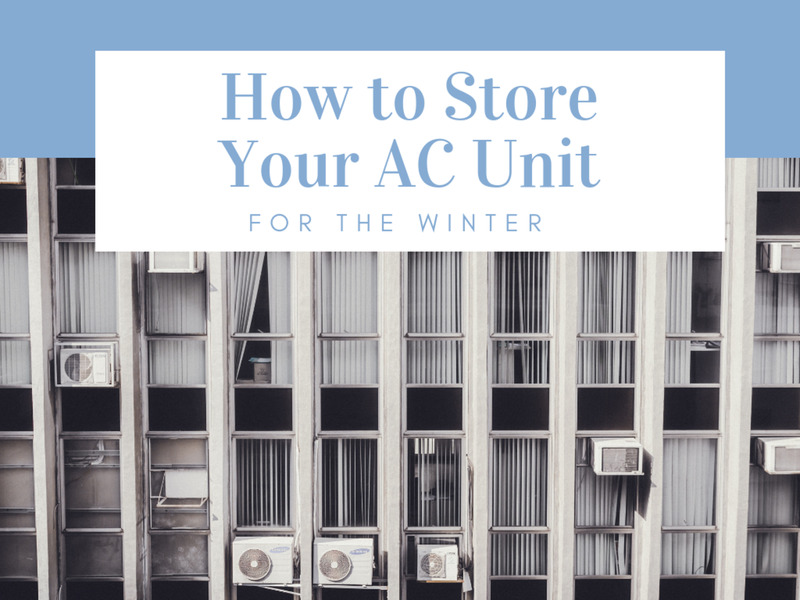 You have taken a topic that is intimidating to most homeowners and given simple, well illustrated information that explains the basic parts of the air conditioning system. This is an excellent hub, Cre8tor....It's so nice of you to share this specialized information, and you did it so well--photos and all. Stopping back by just to say congratulations on Hub of the Day. All of your HVAC hubs are incredibly useful for us often-baffled homeowners. I just had to check this one out again! Such a helpful hub - congrats on being selected as HOTD! So deserved! Great Hub, bookmarking this one for future reference. Voted up and shared. Great, informative hub - congrats on Hub of the Day! Voted up across the board. Thanks Simone! Your inspiration is greatly appreciated! Whoah, how cool it is to actually know what's going on inside these things! I love this Hub, and the photos and your explanations are incredibly useful. You rock, Cre8tor! Ah, yes - yet another piece of my home that's getting ready to crater! I'm so glad to see this glossary of terms. I'm lost when the repair crew comes out and rattles off the list of what's ailing. Thanks! Wow, fantastic hub Cre8tor, now I can bookmark it instead of pestering you with questions lol. Voted up awesome and shared! You're welcome. My goal is always to make these things easier for the average homeowner to understand. Knowledge is power. Thanks for demystifying how an air conditioner works. I wish I knew all of this in the past when I've had HVAC guys out to do repairs so I could better understand them.